Enjoy Cool, Clean Air Anywhere! 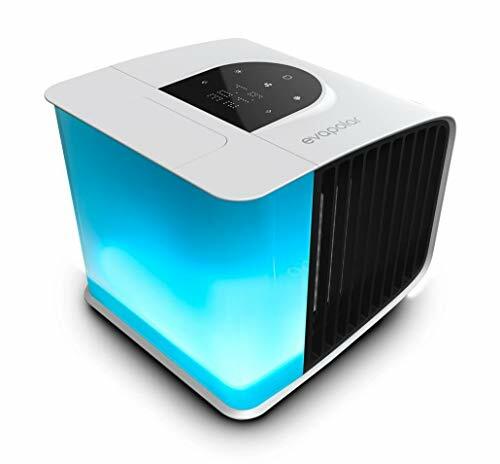 Introducing Arctic Air: The powerful, compact personal air cooler that pulls warm air from the room through its evaporative water filter to fill any space with cool, clean comfortable air! 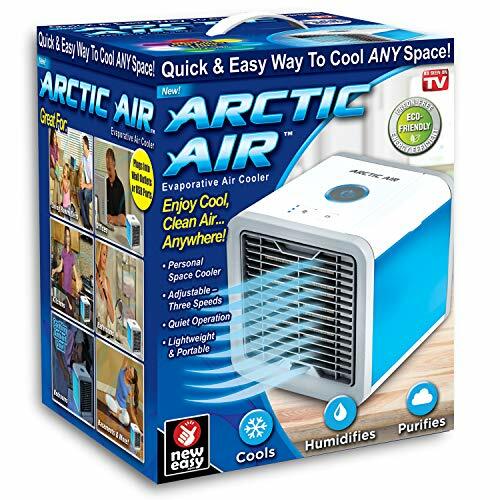 Arctic Air cools, humidifies, and purifies for better air! Simply fill with water, plug it into any standard wall outlet or USB port and enjoy! It runs up to 8 hours per fill! Arctic Air is an evaporative air cooler that allows you to create your own personal climate! The whisper-quiet fan and soothing night light make it perfect to use throughout the night for a comfortable sleep! The built-in LED mood light can be set to any of its 7 color option, set to color-cycle mode or turned off with the touch of a button! Running other air conditioners all day long can cost a lot of money and take up so much space! Some of them even have to vent out a window, making it very inconvenient. Arctic Air sleek compact design fits nicely on your desk, nightstand or coffee table wherever you need it! It s great for dens, reading nooks, work, dorm rooms, offices, home offices, campers, work spaces, benches, basements, garages and more! It s lightweight & even convenient for travel! Great for outdoors too! It s not just safe to use but energy efficient !This personal space air cooler actually cools the air around you, where you need it most, while using the size and power consumption of a small fan! Personal Space Cooler that Lets You Create Your Own Personal Comfort Zone.NOTE: Kindly refer the user manual before usage of the product. Built-In LED Mood Light - 7 Different Colors with Color-Cycle Option! Personal Air Conditioner Cooler, Humidifier & Portable Mini size table fan. Introducing Cellar Air Cooler, the most efficient cooler ever made. The Cellar Air Cooler is a small portable USB-powered air cooler/conditioner that spreads fresh, cool air at your convenience. This compact, eco-friendly personal air cooler, pulls warm air from the room, and through an evaporative water filter, it cools the area around you. It can be used as a fan, as well as a night light with its unique 7 LED coloring panel. The Cellar air is convenient for it is portable and can be powered by a power bank or a computer/laptop. It consumes only 10W of electricity, making it very efficient. The Cellar air is 100% safe for children and pets. The Cellar air is easy to set up and use! Simply pour water in the tank, plug it in and enjoy! Its evaporative function allows you to create your own personal climate at a touch of a button. The digital temperature display on top lets you select your desired temperature. It has a quiet, three-speed fan, adjustable air vents, water reservoir and LED light. Place the Cellar Air on a raised surface such as a table, desk or counter top. Let filter absorb water for at least 3 minutes after filling tank and before use. A full tank will provide approximately 8 hours on the low fan speed. The unit will still work even when the tank is empty as long as the filter is damp. 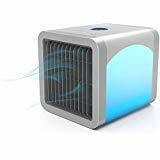 [PERSONAL AIR COOLER] The Cellar Air Coolant pulls warm air from the room through its evaporative water filter to create your personal space with both humidified and cool air. [SIMPLE TO USE] Simply add water into the tank, plug it into USB port or power bank and TURN ON. The Built-in water tank lasts up to 8 hours once fully filled. [USER FRIENDLY] Does not require batteries as it has a USB charging port design. Its small size makes it very convenient and Portable to take anywhere. [BUILT-IN NIGHT LIGHT] Built-in LED light with 7 colors allow you to customize this mini air cooler and display a mixture of bright lights to set the mood. [BUY WITH CONFIDENCE] Cellar Air offers 1-year buyer assurance and lifetime support. Have a personal cooling device and help you save money than using traditional air conditioner. It blows cooling wind, keeps your skin moisture and enjoy fresh air. The portable air cooler fan is convenient to carry to the necessary places such as office, bedroom and children's room. -Create a personal cooling zone. -Choose from 3 speeds (I,II,III) cooling wind. -A tank of water can continuously spraying for 3-6 Hours. -Humidification function can automatically turn-off when the tank lack of water. -Wind outlet blade can be 120 adjusted up and down like air conditioning. -No freon and health. Energy-saving design. a. Keep it balance and open the water tank lock. b. Add water or water with ice cubes or essential oil in the water tank. c. Upwards to open the wind shield, and downward the front mini water tray. d. Press the power button , the fan start to work. e. If you need to open the Humidification function, turn the humidification function button on. 1.Recommend to add 3/4 water of the tank, do not full filled. 2.Use cup brush or toothbrush to clean the water tank once a week. 3.This Fan is for personal use. Please put it beside you not over than 3ft- 4 ft. It don't use any coolant and can't cool down the whole room. Net Weight: 26.45 oz (750g). PERSONAL SPACE COOLER: Three-speed mini cooler fan, designed for creating personal space cooling. Using the latest evaporative misting cooling technology, which can keep you away from dry air and enjoy misting air. 3 IN 1 FUNCTION: This portable air conditioner cooler can cool, humidify and purify the air around you. Easy to operate, you can fill cold water with ice cube for mist humidify cooling air. UNIQUIE DESIGN: Mini Water Tray design for preventing the desk getting wet. You can also adjust the wind direction according to your need, support vertical direction rotation. Easy to carry to places like office, bedroom and children's room(Adaptor included). 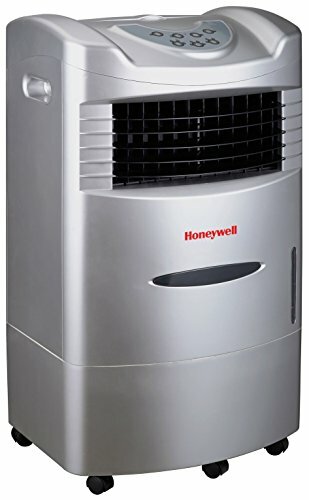 AFFORDABLE & PORTABLE: Efficient alternative to an air conditioning unit as well as an efficient replacement for a fan, affordable and energy-saving. This space-saving air cooler, 9.5 inch portable size, can fit nicely in work spaces, dorm rooms, offices and more. FCC and FDA certified, 100% safe for children and pets, energy-efficient. Misting function will be automatic shut off when the water tank runs out of water. 30 Days money back guaranty, 1-year manufacturer warranty for quality related issue. Uses significantly less electricity than an Air Conditioner in a room up to 300 sq. ft. Designed with a triple feature usage, can also be used as a swamp cooler and humidifier all in one! Warranty: All product are backed by a 1 year warranty against manufacturer defects. Warranty voids if purchased from any other seller that is not amazon retail or air & water inc.
evaSMART is a personal air cooler that creates your local microclimate. Evapolar is a 4 in 1 device: it cools, humidifies, and cleans the dust particles from the air making it healthier for you. 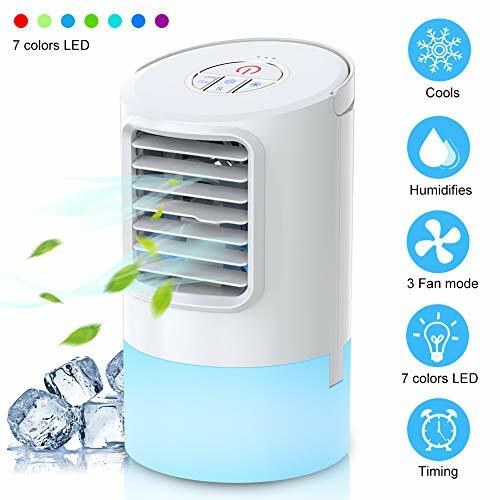 This portable air conditioner has various Smart features to enrich your comfortable experience: works with smart home assistants and is operated via mobile application. It doesn't take much time or effort to install evaSMART just pour water in the tank, plug it in, set the Wi-Fi on and enjoy. evaSMART working principle is based on the natural water evaporation technology. It is the most efficient evaporative air cooler of this type. No other device is able to give that cooling performance in such a small size. Since evaSMART is an evaporative air cooler, it takes hot and dry air and makes it cool and moist. The performance of any evaporative air cooler depends on the temperature and relative humidity to understand how evaSMART will perform in your conditions, see the temperature drop table image. evaSMART will work best in dry climates, but we don t recommend using it when humidity is higher than 70% in your room. For the best cooling experience, use it in an open environment with adequate cross ventilation. Inside evaSMART, there is an innovative fully inorganic material that inhibits the growth of mold or bacteria. This EvaBreezeTM patented material is fully biodegradable and, together with low power consumption, makes evaSMART green and environment friendly. Each easily replaced cartridge lasts 3-6 months, depending on use, air and water quality. An LED display shows the temperature of both the incoming and outgoing air. You can also choose a variety of light colors for your water tank lightning to suit your mood. Through mobile application, you can access an extended list of features such as humidifier control, sleeping mode control, additional color playlists. The best advantage of evaSMART working with smart home assistants is that you can switch your device without using your hands. Cooling Pad Type:Cellulose honeycomb pad;The NewAir AF-1000R can decrease the temperature by up to 30 degrees. Do You Want to Enjoy Cool, Clean Air, Anywhere in Summer? Try our portable compact personal air cooler. It pulls warm air from the room through its evaporative water filter to fill any space with cool,humidifies aand clean comfortable air! You can add pure water,small ice cube. in the water tank, plug it into any standard wall outlet and enjoy! It runs 6-8 hours per fill. It's Not Designed To Cool A Whole Room,But It Is Intended To Send Cool,Cold,Or Humidified Air Approx 3.2ft Max To Where You Need It,On You!Cool And Comfortable And The Multi Speed Cooling And Fan And 2-Way Air Direction Help Spread The Air Evenly Throughout The Room. It is 3 speeds(I,II,III) ,and 2 Automatic Timing (2H/4H), you can adjust it easily. Built-In LED Mood Light - 7 Different Colors with Color-Cycle Option! 2. Water Tank Max. Volume is 400ML, Adding 3/4 Water in the Tank is the best, Do Not Full Filled. 4. If you would like to enjoy cooling wind you can ice cube in the water tank. 5. When have water in the tank,please keep it level,remember to move in paralle,don't lean it . Multi-function Personal air conditioner cooler, fan, air humidifier, air purifier 4 in one multifunction design. Cools, humidifies and purifies for better air, refrigeration design take you away from the hot summer, enjoy your cooling summer. Adjustable Wind Speeds and Automatic Timing Three wind speeds (high,Medium,low) can be adjusted, the maximal fan rotating speed arrives to 3.24m/s, manual up-down to adjust blowing direction in 80 degree ,creat your own personal cooling zone.Two automatic timing (2H/4H), you can choose the most suitable one to enjoy your leisure time,sleeping or working time. Built-In LED Mood Light - 7 Different Colors with Color-Cycle Option! It allows you to customize this mini air cooler and display a mixture of bright lights to set the mood. And can be used as a night light. Removable DESIGN and PORTABLE DESIGN Removable design helps you better clean your water tank and you can add water& ice cube in the water container, to Increase the moisture of the air; Only 21oz , with Lightweight and portable handle, easy to move, perfect for your desktop and office/dorm room, ect. 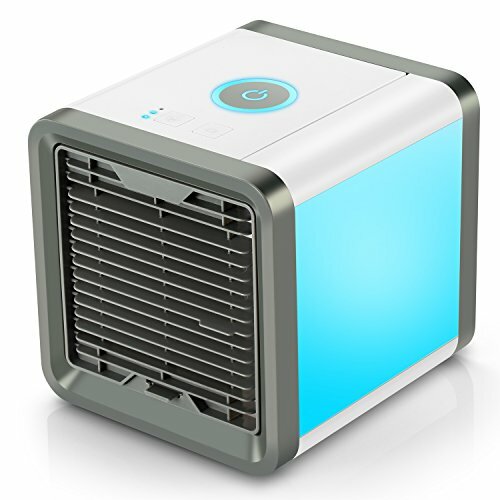 Personal Air Cooler Mini personal air cooler designed for individual use, It does not use refrigeration or chemicals to cool the air, so you should not expect the same results as an air conditioner. Please Put it Beside You not over than 3ft-4ft. 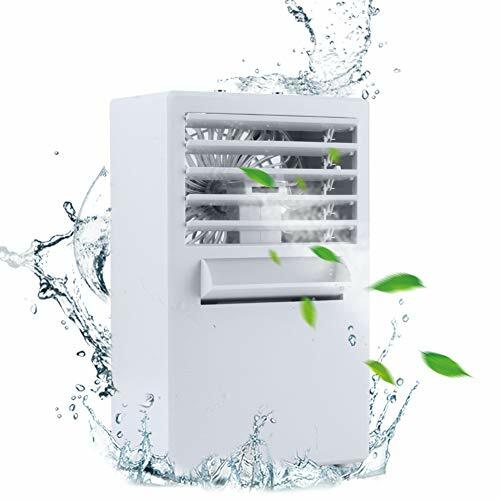 This indoor portable Evaporative Air Cooler is versatile, which can be used as a fan or humidifier. Improved control panel and remote control will bring easier and more convenient use. It is energy saving and perfect for using in home, office, dorm, etc. - The compact and lightweight air cooler is easy to carry and storage, and fits discreetly in most spaces. 4 caster wheels make it easy to move your unit from room to room. The compact and lightweight air cooler is easy to carry and storage, and fits discreetly in most spaces. 4 caster wheels make it easy to move your unit from room to room. 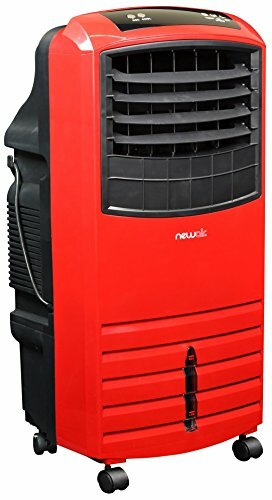 Regular central AC system is uselessly cooling the entire building, wasting your money while you are sitting in one place.Now you can have your personal cooling device,save your money with Vshow Portable Air Conditioner, it blows cooling wind,keeps your skin moisture and enjoy fresh air. 6. Net Weight: 27.16 oz (770g). 1. Keep the personal air conditioner balance, don't tilt it when working. 2. Add pure water or household tap water to avoid impurities affecting the cooling function. 4. Please run out of the water everytime, to prevent the water tank left some scale. 5. Use Cup brush or toothbrush to clean the water tank once a week. Quiet Cooling Fan 3 wind speeds opintions ,the maximal fan rotating speed arrives to 3m/s,manual up-down to adjust blowing direction in 120 degree ,creat your own personal cooling zone. Air Conditioner Portable Based on the natural water evaporative technology,you add water&ice cube in the water container, the fan blows out cooling wind to cool you down instantly..Easy to carry on to the space you need to cool air with super Mini air conditioner fan size 5.7'' x 3.9'' x 9.5'' (L*W*H), Perfect for your bedroom, office, dorm room, on your desktop and table top. Save On Electric Bill Low Energy Consumption same as the power consumption of a light bulb,uses no freon,much cheaper than running a freon air conditioner in Hot Summer Days. Air Humidifier Features large water tank,continuously spraying mist for 3-5 hours. Drop your favorite essential oil into water,blows out cooling moist air,keeps your skin moisture and purify for better air. Easy to Use Simply fill with water,plug it into any standard wall outlet, it runs up to 5 hours per fill.Notice that the space cooler is small size for personal use,not a air conditioner,can't cool down a room. Our 18'' pedestal fan has seven high-performance blades to move a high volume of air wherever it's needed. With 12 wind speed and 3 fan mode, you can customize this fan for optimal comfort. The 12 hour programmable timer and remote control will provide you with more convenience. The height of this fan can be adjusted to meet your different needs. This oscillating stand fan can make all the room cool, and give you a more comfortable and consistent breeze. 12 SPEED SETTINGS AND 3 WIND MODES You can easily choose between 12 wind speed settings and 3 fan mode for temperature control and optimum comfort. INTELLIGENT MODE Temperature can be set from 60 F to 77 F, and fan speed will be set according to the temperature automatically. 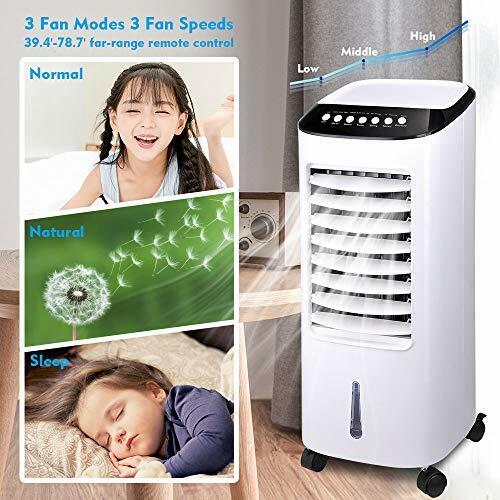 12 HOURS AUTO ON/OFF Convenient electronic timer can be set from 0 - 12 hours, you can customize this fan for optimal comfort. REMOTE OPERATED It comes with a remote control which enables you to control all the fan's power, speed and wind settings from anywhere in the room. OSCILLATION STAND FAN The fan has an oscillation feature which can distribute the air around the room and make the whole room cool. TOWER FAN & EVAPORATIVE AIR COOLER 2 IN 1 This Trustech tower fan can be used alone or as an evaporative air cooler. Water curtain system with 2L water tank capacity and 2 ice boxes, Trustech tower fan can offer you up to 120 Sq Ft air circulation in a fresh and cool way. The drier air will absorb the cool moisture, resulting in a lower and comfortable temperature, the evaporative air cooler offers you an effective method of cooling yourself down on a summer day. 70 OSCILLATING FAN & ULTRA-QUIET This Trustech oscillating fan benefit to improve any circulation for a wider area. Trustech oscillating tower fan has 3 modes (normal wind/natural wind/ sleep wind) and 3 wind speed settings (low/middle/high). Timer function enables programmable shutdown up to 8 hours, sweet dreams and peaceful sleep can be achieved with the help of our ultra-quiet tower fan. ADD MOISTURE TO DRY ENVIRONMENTS The key to effectively cooling your home with an evaporative cooler is hot, dry air such as what is found in desert areas like the southwestern United States. 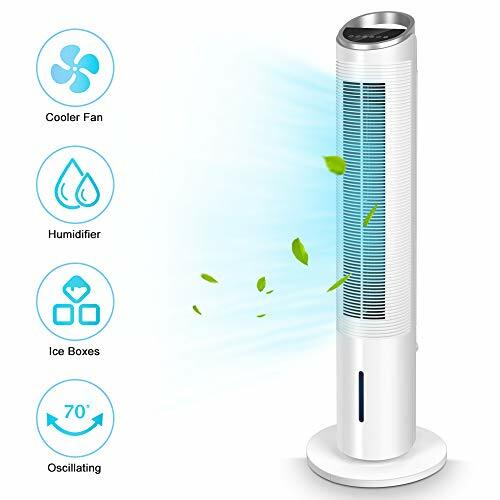 Not only does this help make the air 'feel' cooler, but may also help relieve some of the symptoms associated with itchy eyes, dry skin and sore throats. LOWER PRICE MORE EFFICIENT By positioning fans near your air conditioning window units or in proximity to air vents where central air emits, you can circulate the cool air over a wider area, cooling more of the home. Lower overall price point, are more energy efficient, evaporative cooler costs up to 50 percent less. And are much more environmentally friendly than traditional air conditioning systems. 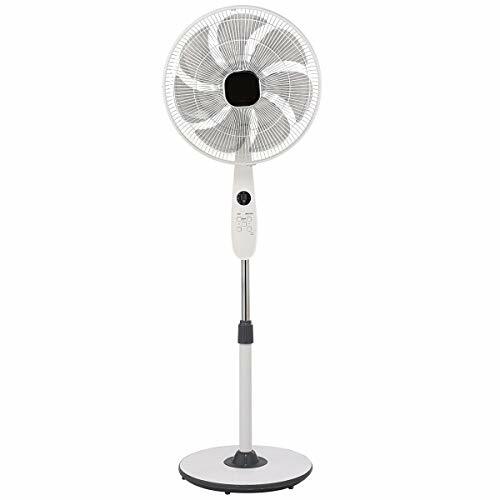 LIGHTWEIGHT & SAFE DESIGN Lightweight design and the convenient carry handle on the top make this evaporative tower fan easy to move from room to room. Tiny fence design eliminates the risk of children's finger inserting, which makes a safe and cool environment to your family. Trustech provides a 24-month warranty on any servicing operation. Unlike a traditional fan or air conditioner, an evaporative cooler offers better cooling with a higher wind volume, lower temperature and the ability to perform other functions too. 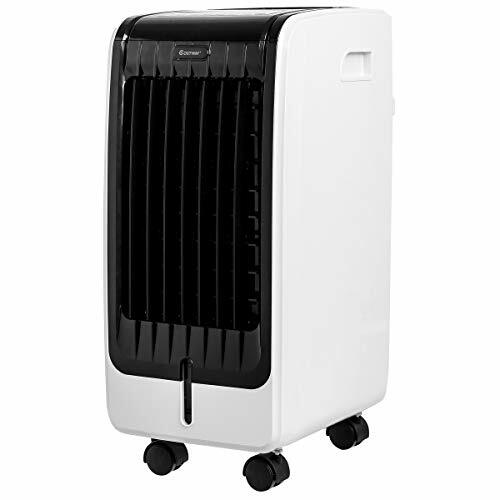 The Costway Evaporative Cooler is an air cooler and humidifier roll into one compact and stylish machine. To use it as an air cooler, simply prepare the included Ice Crystals according to instructions, leave it in the 6-litre water tank and turn on the Evaporative Cooler to get super cool breezes through its automatic swing louvers. Adjustable Speed--- Three-speed air cooler could meet your different needs and be applied in various occasions. You could enjoy low speed when you are in sleeping and medium speed in relaxing, as well as high speed in scorching summer. Cool/Humidify--- Adopt ice crystal refrigeration and air humidifying technology, can cut down the temperature from air vent and raise relative humidity, prevent air drying. Deliver Wind at Wide Angle--- Swing the blades automatically, deliver wind at horizontal wide angle. Also can swing the blades vertically manually, select the direction discretionarily. Timer Function--- 8-hour timer function make the air cooler stop automatically after you set the performance time. Then you could fall in sleep securely. Large-capacity Water Tank and Universal Wheels--- 6L large-capacity water tank prevents you from adding water continuously. And you could freely move the air cooler from room to room for its wheels. Dimension: 24.5" x 14.5" x 12"
Adjustable Speed Three-speed evaporative air cooler could meet your different needs and be applied in various occasions. You could enjoy low speed when you are in sleeping and medium speed in relaxing, as well as high speed in scorching summer. Cool/Humidify Adopt ice crystal refrigeration and air humidifying technology, air cooler can cut down the temperature from air vent and raise relative humidity, prevent air drying. Deliver Wind at Wide Angle Swing the blades automatically, deliver wind at horizontal wide angle. Air cooler also can swing the blades vertically manually, select the direction discretionarily. Timing Function 8-hour timing function makes the air cooler stop automatically after you set the performance time. Then you could fall in sleep securely. Large-capacity Water Tank and Universal Wheels 6L large-capacity water tank prevents you from adding water continuously. And you could freely move the air cooler from room to room for its wheels.